Got a reasonably early start and headed into Dundee to do a bit of shopping. Some nice shopping centres and one touristy shop but couldn’t find anything really appealing. Did find a starbucks though. Back to June’s and then to the home to pick up grandma. She was in good spirits, a little more energetic at 11 o’clock in the morning. We took her round to Emma’s and saw her and Emily, then Susie came round for lunch as well. 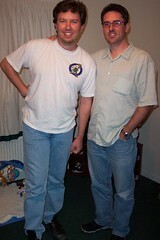 Watched Monsters Inc. and chatted for a while, managed to get in touch with Steve K. and arranged to meet that evening. Grandma was getting a bit anxious, perhaps because she was in a more unfamiliar environment & surrounded by more people she didn’t recognize, so we packed her back off to the home. 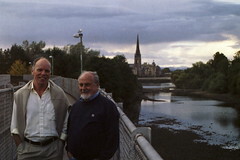 Dad & I were at a bit of a loose end so we headed out to St. Andrews, too early to meet Steve but we did some sightseeing and some shopping (some nice stuff but expensive!) The town is rather nice though, very quaint and with the abbey and the castle. Apparently Chariots of Fire was filmed on one of the nearby beaches here. Had a nice pint in “The Keys” and then headed back to Dundee to drop off dad. Came back and met Steve & Teresa and went to the Inn on North St., which is a pub/restaurant upstairs and nightclub downstairs. Food was OK, beer was better. S & T are doing fine, and little Saskia is a cutie. She was very well behaved throughout the meal but we left after a while, worried about the smoke. Went back to their place in Strathkinness, a small nearby village, and chatted for a while, saw Steve’s collection of Star Wars stuff and Lego (!). He will never grow up. Dad slept late this morning so we got away a bit later than we expected. Drove down to Preston Pans in the morning and saw Grandad Penman’s old house. Drove around the neighborhood a bit but nothing really looked familiar. The church where mum & dad got married has maybe been knocked down, where dad thought it was there was a much newer looking church. Drove up to Grandma Galloway’s old house, but it didn’t really look familiar either. Next headed up to Dundee, stopping at Kinross for some lunch and then found Aunt June’s place about 2pm. Saw June, and Susie, and Emma; later on Rachel & Tracy dropped by as well. We went out to the nursing home and picked up my grandma. She has advanced Alzheimers and short term memory only, but she is in good shape physically and in good spirits. We took her for a little walk around the garden, she is particularly enchanted by little Emily (Emma’s daughter), who is quite good with her too. She had a little bite to eat and June made some dinner (cold meat and salad – a tradition at home!) for us, which was very nice. We left around 7pm to visit Ian & Moira in Perth. Alas we took a wrong turn and had to go through the center of Perth, which slowed us down enough so that we missed him at home. But we did meet Cara (Ian & Moira’s daughter) and Anna (?) who gave us some beers and chatted until Ian came back with son John. Lovely family, and beautiful house near the Isle of Skye hotel in Perth, just 20 min away from Dundee. They offered us some dinner but we gave our excuses and came home, both of us buggered. We checked in, I called Jasmina and wrote this. It was only about 100 miles to Edinburgh via the A1 – dad usually comes up from Leeds, which is much further, and so overestimated the time we’d need to drive. We stopped briefly at Carter Bar on the border, where you have a great view both ways over the fields. Not much difference apparent either way! 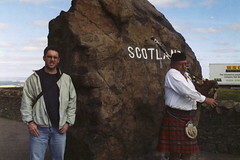 The “Pipers of the Border” welcomed us home with Scotland the Brave. Quick piss-stop in Jedburgh and a photo of the abbey there. Drove to the centre of Edinburgh and parked in a multistory carpark there at St. James shopping center, and also grabbed some lunch. Next it was up the Royal Mile (aka High St.) towards the castle. Lots of tourist shops, cafes, restaurants etc. We arrived at the castle just in time for a free guided tour by a possibly local fellow called Ian Bruce, which was very informative and entertaining. The tattoo and the festival were just finished, they were dismantling the bleachers on the esplanade as we arrived. The castle is fantastic, very beautiful and in excellent condition. In fact it’s still fully operational, with a garrison and a military prison. 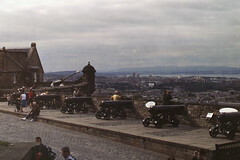 The cannon is fired at 1pm every day from the battlements. 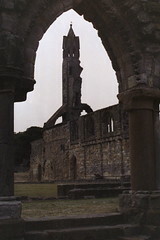 Only one building remains from the oldest time, the 12th century St. Margaret’s Chapel. 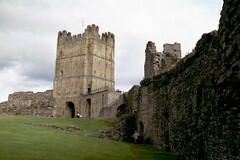 The rest has been rebuilt or deliberately destroyed at various times thoughout the castle’s tumultuous history. I bought some postcards and a very small bottle of Laphroaig for my computer (which is so named) back at work. Back down the hill and past the university, saw some of the old buildings dad used to study in. We were short of time a bit so we hurried back to the car and went off to an old haunt of dad’s in Morningside, “The Canny Man’s”. Beautiful old pub with a truly astounding abundance of portraits, old bottles, skis, swords, musical instruments, and every other thing you can imagine on the walls and hanging from the ceiling. Had a couple of great pints there and then went for a sombre visit to the cemetery where many on my mum’s side are buried. Got going around 9am and headed into Richmond. The castle wasn’t open until 10, so we went down past dad’s old school. Lots of changes and new buildings, although dad had mentioned it was closed it looked like it was just school holidays or something. The playground is now ashphalted (in dad’s day it was grass). Back up to the castle and had a very nice time wandering around it. The keep is in very good condition and you can climb right to the top. The great hall (3rd floor) has a re-created medieval feast set up with lots of rubber (not rubbery) food and simulated messiness. We walked right around the walls, on one side the ground drops away steeply to the Swale, many of the buildings on this side fell away into the river many years ago. Had a sandwich for lunch at the tea room as part of the Edinburgh wool shop, and then went off to Hudswell. We walked around the cemetery at the church, and found graves of some of the people dad knew, and some who he hadn’t known had died. Earliest grave we found dates back to 1711, but there are possibly older burials there. The cemetery is in pretty bad condition, very overgrown and many graves fallen over and in poor repair. Later at the pub (George and Dragon) in the village we asked one of the locals about it, they are open for evening sermons there once every few weeks. But otherwise it’s unused. The bloke who had the key wasn’t home, so we tried coming back later on our way back but no luck. Dad wanted to show me a commemorative plaque listing those men from the village who had gone to the war, which included his dad. We went for a drive up the Swale Dale on the B6270, pretty hairy. 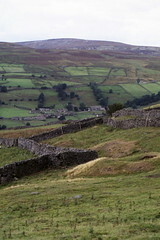 There are little villages every few miles, Grinton, Reeth, Healaugh and Low Row, with grey stone buildings set literally right on the road. Of course, they pre-date the road, but it still seems unnatural. We noticed the hamlet of Crackpot on the map and determined to find it, we probably went through it but it’s just one or two farms and possibly a bed & breakfast. We took a very poor road up over Redmire Moor to the south, had some incredibly steep places. Up on the moors the view was beautiful, right up the dale; and quiet, just us and the sheep. Came down past Castle Bolton and joined the A684, then the A6108 back to Richmond via Hudswell. It was early but we didn’t have much else to do, so we had a pint in the Fleece (trendy bar, with ribald shooters shaped like spermatozoa) and then some more beers and dinner at the Town Hall Hotel. Still early , but we’d had it so we came back to the Travelodge. Off to Edinburgh tomorrow. A final trip round the service area and then onwards. First stop was Pontefract/Featherstone and the house Dad was born in. We also saw his grandad’s old place, but it had changed so much it was almost unrecognizable. We drove around a bit more and saw a second house where him & grandma lived, a lot has changed dad said, probably because the area was re-engineered to admit cars. We also went up to North Featherstone cemetary where both dad’s grandfathers are buried, Tom and Fanny Keenan as well as James (their son) and his wife Emily. On the way back we had a quick look at Pontefract castle, which dad had never seen! Pretty bad condition but the ruins and surrounding buildings are rather impressive. We returned to the A1 and took the A64 into York, a bit of stuffing around finding a park and then walked in through one of the gates remaining in the almost complete city wall. The city is incredibly dense with narrow streets and close 2-3 story buildings. Some beautiful tudor houses overhanging the street. First had a look at Clifford’s tower, shell is complete and you can climb up within the wall and walk along the top. Southern wall has a noticeable outwards lean to it, possibly due to damage of the foundations due to a big flood. Next on to Jorvik which is a rather cheesy recreation of the Viking village which preceded the modern city of York, circa 985 AD. Poorly animated mannequins but the smell was unfortunately authentic! Recreation is based on actual archaeological excavations on the site, from which they have apparently got a very clear idea of how life was on the site; have uncovered well-preserved houses, leather goods, you name it. We were peckish by this time so ducked into a likely-looking pub (the Golden Fleece) and had an awesome Yorkshire pudding with roast beef, potatoes, vegetables and onion gravy. I’m telling you, this meal was incredible. Washed down with a pint of Guinness. Finallly we took in the cathedral (York Minster) which is beautiful and impressive. We went down into the undercroft, where they have shored up the foundations and in doing so uncovered the previous Norman and even earlier Roman foundations. Supposedly this site was where Constantine was declared Emperor around 300 AD(?). This was really amazing, the way they have built and re-built and overbuilt on the site to create what is there now. One funny story about Saint William, who was (I think) just a regular clerk who got hit on the head by a stone falling from high up within the cathedral. He survived, and became a saint by virtue of this “miracle”. They even dug up the stone much later, which is about the size of an overnight bag, inscribed with the whole story. Saint William is interred in the crypt below the altar. Dashed back to the car and headed north again towards Scotch Corner on the A1 and our Travelodge for the night. After lots of driving around stupidly we finally got there and dropped off our bags, then headed over to Richmond. We went through Richmond and on to the hamlet where dad lived. It’s tiny, just one street, a pub, a tiny school and a disused church. Grey stone buildings set close to the road, which is incredibly narrow. Dad’s house was “Rock House”, now a somewhat done up “Rock Cottage”. Continuing on through the town and the road opens up again onto the moors, dad was perplexed by the absence of heather. A couple of “warning – tank crossing” signs testify to the nearby presence of the army. Lots of sheep. The pub had no food on Mondays so we went back into Richmond and had a bit of a walk around before settling on the Turf Hotel for dinner. Cod & chips for me and a gammon (ham) steak for dad. And more Guinness of course. Great meal, I am going to be fat at the end of this trip! Got into London yesterday about 10:30 am after a pretty brutal trip. Dropped off my luggage and went into the city via the tube. Things still coming back up to speed after the power blackout yesterday, I think; the train was packed. Got off at Picadilly Circus and walked down Regent St., some lunch at Marios Cafe (₤10), not bad. Turned right on Pall Mall and walked down the other Mall and past Buckingham Palace. Hordes of tourists, but everything is beautiful. One poor copper at the open gate, you have to wonder how many photos he ends up in every day. Turned left around the park towards the river. Walked through horse gate, and then down past Westminster Cathedral and the houses of parliament. Weather was great, a bit cool but mostly sunny. Crossed over the river and walked along the embankment, past the big ferris wheel thing, Saatchi and Tate galleries, and a cool under-bridge book market with some beautiful old maps. Went over to have a quick look at St. Pauls, currently being restored so where it’s not filthy it’s covered in scaffolding. Should be nice when it’s done. Someone was getting married there as I arrived. Some beautiful llittle streets nearby, a lovely old building with distinctive writing on the outside was actually a hostel, very nice looking! Had a Kronebourg in what looked like a pretty authentic pub the “Rising Sun”. Finished up at the tower of London, ₤13.50 to get in but worth every penny. Very cool. Got back to the airport a bit late, more than an hour on the tube again, Dad was already there. He was in pretty good shape, came over first class so had some nice food and comfortable seat and everything. 8h stop in Bangkok but they put him up in a hotel, so that was nice. We went and picked up the car, a Toyota of some description and headed up the M25 to a service area near Toddington. Travelodge is basic but comfortable. Dinner at the “Little Chef” (always present with Travelodges!) not too bad. Today we left Toddington after a reasonable breakfast at the service centre. Had about an hours drive to Mac & Gillian’s place in Campton, in Bedfordshire. Met Dad’s Aunt Alison for the first time; Gillian is her daughter, and also her brother David. We had some coffee and sat out in the garden and took some photos. Then we went to the White Horse pub for lunch, after a little tour of the area courtesy of Gillian. It’s really beautiful, lots of little villages with names like Inkworth and Ireland, thatched rooves, village greens and that sort of thing. Had a pretty nice steak and some NZ wine, “Montana”. Our route so far has taken us up the M25 from Heathrow, across via Campton to the A1, and then just straight up to Ferrybridge (junction of M62 and A1). Also known for a bloody big power station within half a k of the junction!